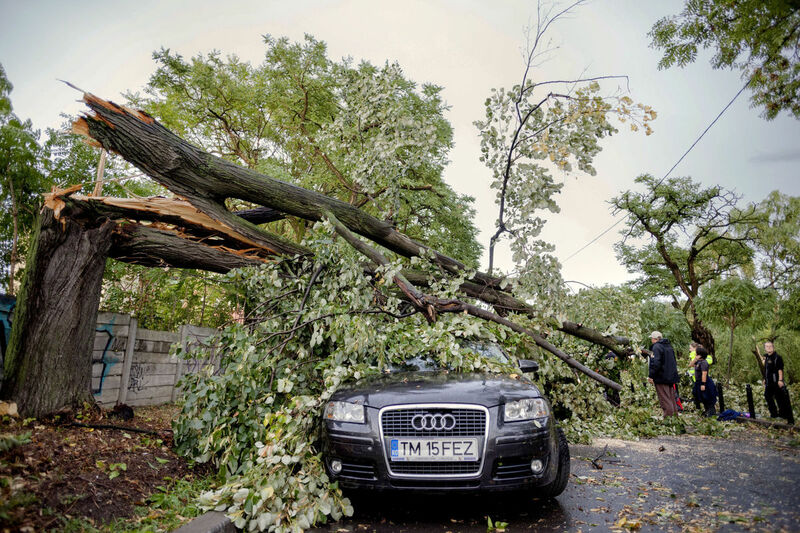 Eight people lost their lives and almost 70 were injured as powerful storms hit Western Romania on Sunday evening. The wind reached speeds of up to 100 kilometers per hour bringing down hundreds of trees, electricity poles, and tearing household roofs. The most affected areas were Timis and Arad counties, in Western Romania, where six people were killed in the storm. In Timisoara, a woman died after being hit by the branches of a tree at the city zoo. Another man lost his life after a billboard fell on his car, according to local Mediafax. Some 27 more people were injured in Timisoara, where the wind was so powerful that it even overturned trucks on the road. Two people were also killed in Bistrita-Nasaud county, in Northern Romania. One of them was hit by a tree in the city's park. In Alba county, over 15,000 households were left without electricity as the powerful wind broke the electricity lines. Six people were also injured in Alba. Romania has experienced unusually hot weather for this time of year in the last few days, with temperatures reaching 34 degrees Celsius in the Southern regions on Sunday. The weather is expected to turn bad in the next few days and rain may take over the country.